Swiss Cottage Bed and Breakfast01493 855742work Guest AccommodationSwiss Cottage Bed and Breakfast in Great Yarmouth, accredited (AA 4 star and AA Silver 4 Star, Tripadvisor Green Leader, Certificate of Excellence 2017,Top grade 5 hygiene), on the seafront, friendly, pleasant, attractive and welcoming guest house. You're warmly invited to stay in the relaxing surroundings of this Edwardian guest house. The rooms are tastefully decorated and the feeling is one of peaceful satisfaction. Perfect for a stay in Great Yarmouth, Norfolk. All rooms are en suite and some look out over the pretty Venetian waterways gardens and across the dunes to the shoreline and sea beyond. All rooms are centrally heated and enjoy LCD colour television with freeview, Free Wireless Internet access, radio/alarm, tea/coffee facilities. Rooms serviced daily. Comfortable beds and pleasant decoration in keeping with the building. The accommodation has ample, free parking in an enclosed courtyard at the rear of the building. Come stay for a night or take advantage of the discounted breaks. Breakfast of cereal, fruit juice and grapefruit. Freshly brewed coffee is available throughout breakfast time or have a pot of tea made just for you. Be satisfied by a full English breakfast freshly cooked with sausage, egg, bacon and tomatoes, mushrooms and beans, vegetarian and other available alternatives, gluten free and dairy free. Finish the repast with toast, butter and marmalade or jam. Enough to satisfy and to begin the day whether on holiday or business. The available room options will be shown below. Click the 'Reserve' or 'Book live' button to book the highlighted days: . With Book live the booking will be confirmed immediately; with Reserve the reservation will be confirmed within 24 hours. Swiss Cottage Bed and Breakfast sometimes limits bookings to 2 or more days. Contemporary Large Double Room  on Top Floor overlooking courtyard car park and recreation ground. Medium size dog friendly but check with us before booking. A single occupancy rate available in all non single rooms. Rm 2 Large sometimes limits bookings to 2 or more days. Contemporary Large Double Room  top floor location. Views through side windows across dunes to the shore. Medium size dog allowed but check with us before booking.. Comfortable settee. Free WiFi, Complimentary tea and coffee, Freeview LED colour tv. Rm 3 Large Dbl sometimes limits bookings to 2 or more days. King Room  Contemporary style with Edwardian features The room has fabulous views across dunes to the shoreline beyond. Free WiFi, Complimentary tea and coffee, Freeview LED colour tv. Medium size dog friendly but check before booking with us. A single occupancy rate is available in all non single rooms. Rm 7 King Seavw sometimes limits bookings to 2 or more days. Contemporary Room  located on the GROUND floor with low views out to the front and back suitable for 'walking disabled'. Free WiFi, Complimentary tea and coffee, Freeview LED colour tv. Small dog allowed but check with us before booking. External power for mobility scooter. Rm12 Ground sometimes limits bookings to 2 or more days. Swiss Cottage Bed and Breakfast in Great Yarmouth, accredited (AA 4 star and AA Silver 4 Star, Tripadvisor Green Leader, Certificate of Excellence 2017,Top grade 5 hygiene), on the seafront, friendly, pleasant, attractive and welcoming guest house. You're warmly invited to stay in the relaxing surroundings of this Edwardian guest house. Well behaved dogs are welcome by arrangement, Young adults over 16 accompanied by an adult too. 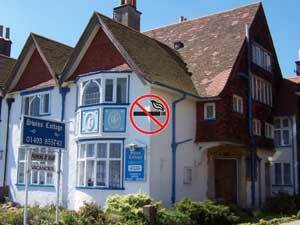 NON SMOKING ONLY. Dogs Welcome [excludes July to September]. Children welcome from age 16. From Great Yarmouth Vauxhall Station which is around 1.3 km away. A number of local taxis firms are available to get you to Swiss Cottage Bed and Breakfast. We have one room ground floor double available for a semi disabled guest. The room is accessed from the lower hall beside the entrance to the car park. One step with handrails lead into the lower hall. The breakfast room is through the lower hall across reception. We do not have wheelchair access or rooms for wheelchair users.